take control. harness volatility. seize opportunity. invest on YOUR terms. TradeStops' investment tools help you navigate the markets with confidence and make sound buy and sell decisions based on math, not emotion. TradeStops' easy-to-master tools help you make better investing decisions, so you can act with confidence - whether you're a novice investor or a grizzled market veteran. Emotions like fear, regret, and greed cause investors to leave money on the table or, even worse, lose much, much more than they should. The TradeStops algorithm helps protect you against these destructive emotions and harness your good emotions for investing. Research shows that investors tend to sell their winners too soon, and hold on to their losers much too long. TradeStops alerts are designed to help you make smarter decisions and avoid the temptation to abandon your winners too soon, and stick with losers too long. Taking control of your investing means making decisions based on data and discipline, not gut feelings. TradeStops puts the investment tools, analytics and critical alerts in your hands, to help you better manage the performance of your portfolio. Investors tend to trust information that support the things they already believe, and ignore information that contradicts those beliefs. TradeStops helps evaluate data more effectively, without bias, to help you make smarter decisions. 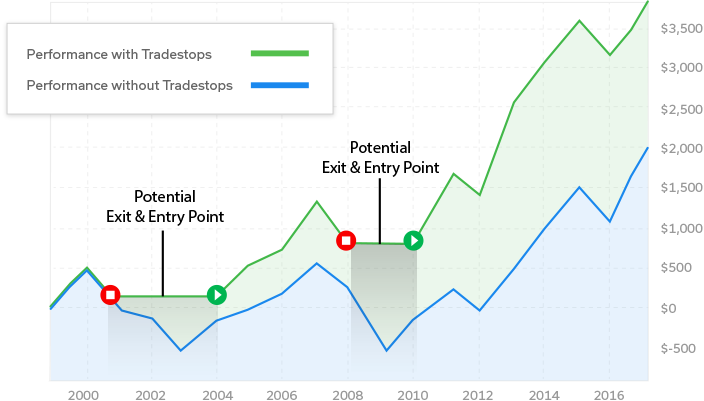 Using TradeStops to alert you when the market turns, could have helped you beat the S&P 500 Index by 2 to 1! Sync your portfolios or manually enter your investments (or “stocks to watch”). We help you analyze what to watch, what to buy, how much to buy and what to avoid. Then, we monitor it daily for you. Based on our proprietary algorithms and your personal settings, we alert you via text, email and/or online when there is a change in your positions. Learn more. TradeStops tools can help you follow a disciplined strategy in an effort to make smarter decisions based on proven data – not your gut, expert predictions or even your past experience. Aim for superior returns while lowering risk. Right-size” your investments by deploying more capital in stocks with less risk. Capitalize on more speculative investments while managing downside exposure. Overcome emotion and market noise with an algorithm-based system supported by Nobel Prize-winning insights. Manage the ups and downs of the market confidently and stress-free with TradeStops' volatility-based tools and systems.